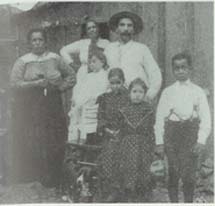 In 1904, the Mexican-American family shown here adopted white orphans from New York through the Catholic church in their Arizona mining town. These families conformed to religious, but not to racial matching. Armed white vigilantes removed the children and placed them in white Protestant families instead. Transracial adoptions might occur when children of color were inadvertently placed with white parents, but the reverse was unthinkable and intolerable. This publicity photo is from Louise Wise Services, an innovative New York agency. 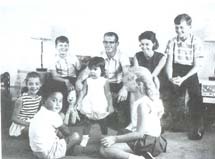 Its Interracial Adoption Program, established in 1953, concentrated on finding matching parents for children of color, but transracial placements were made. Placement across racial lines—which almost always involved non-white children and white adults—challenged matching by suggesting that visible difference was compatible with love and belonging. During the first half of the century, anecdotes about children of color accidentally placed with white parents circulated in journalism, fiction, and professional literature. With few exceptions, these stories were considered tragic and shocking. The problem of racial mixups in adoption illustrated an important point. Most Americans believed in the naturalness of race-matching, but race-matching could be very difficult to achieve, so it was not at all natural in the sense of being automatic. In practice, color confusion was common, and parents and social workers alike expressed deep concern about how to categorize mixed-race children for the purpose of matching. Making families inter-racial on purpose was the point of most international adoptions from Asian countries such as Korea, Japan, and Vietnam as well as adoptions arranged by the Indian Adoption Project after 1945. Attitudes toward these transracial placements reproduced the historical color line in the United States, which was emphatically black and white. White parents were more likely to accept “yellow,” “red,” or even “brown” children. Those who took in “black” children were considered the most transgressive. After World War II, demographic pressures shaped this trend at least as powerfully as civil rights ideology. New contraceptive technology like the pill, legalized abortion after Roe v. Wade, and the sexual revolution all decreased the supply of healthy white infants, along with the stigma surrounding illegitimacy. The result was that some white parents reconsidered their preference for same-race adoptions. Black children and white parents have always defined the debate about transracial adoption, achieving a symbolic importance that overshadowed their tiny numbers. After Loving v. Virginia, a 1967 Supreme Court case that made laws prohibiting racial intermarriage unconstitutional, some states, such as Louisiana, continued to ban transracial adoptions. Family-making between blacks and whites was invariably what these statutes aimed to prevent. Even at their peak around 1970, perhaps 2,500 such adoptions were finalized each year, and no more than 12,000 African-American children in all were placed in white homes before 1975. Researchers, policy-makers, and child welfare professionals carefully scrutinized these adoptions in hopes of discovering whether inter-racial families helped or hurt children, and how. Outcome studies rarely showed that children’s development or identity were positively harmed, but they still could not answer the most important question. Was transracial adoption a socially desirable or undesirable policy in a society dedicated to pluralism but also polarized by racial strife? Determined would-be parents were usually the impetus in the first black-white adoptions. Interestingly, they often lived in overwhelmingly white parts of the country. The first recorded adoption of an African-American child placed in a white home took place in Minnesota in 1948. In Washington, a white couple, the Johnstons, took an African-American child into foster care in 1944, when she was only six weeks old, and adopted her—against the advice of their social worker—when she was nine. Campaigns during the 1950s to promote African-American adoptions inspired other white couples to inquire about transracial adoption. Worn down by the discrimination that made it difficult to find enough same-race parents for all the children of color in need, a few agencies began cautiously placing mixed-race and African-American children in white homes. Some, but not all, of these families became targets of violence and harassment. A program of the Children’s Home Society of Minnesota called PAMY (Parents to Adopt Minority Youngsters) found that its first such placements in the early 1960s were blessedly uneventful. Transracial adoptions were only a “little revolution,” concluded project director Harriet Fricke, in relief. Black children were kin, not projects in racial reconciliation or pawns in racial conflict. The debate about transracial adoption changed course in 1972, when the National Association of Black Social Workers issued a statement that took “a vehement stand against the placements of black children in white homes for any reason,” calling transracial adoption “unnatural,” “artificial,” “unnecessary,” and proof that African-Americans continued to be assigned to “chattel status.” The organization was so committed to the position that black children’s healthy development depended on having black parents that its President, Cenie J. Williams, argued that temporary foster and even institutional placements were preferable to adoption by white families. This opposition slowed black-white adoptions to a trickle. In 1973, the Child Welfare League of America adoption standards, which had been revised in 1968 to make them slightly friendlier to transracial adoption, were rewritten to clarify that same-race placements were always better. The child welfare establishment never supported transracial adoptions. A number of new agencies, staffed almost entirely by African Americans, such as Homes for Black Children in Detroit and Harlem-Dowling Children’s Service in New York, renewed the effort that had started in the late 1940s and 1950s to find black homes for black children. In spite of successful efforts to boost the numbers of black adoptive families, objections to whites adopting African-American children were never translated into law. Minority group rights to children were legally enforceable only in the case of Native American children, and only after the 1978 passage of the Indian Child Welfare Act. Since 1972, the numbers of black-white adoptions have declined, but this may have as much to do with stubborn private preferences and prejudices among white adopters as with organized opposition or public policies that created new barriers to transracial placements. International adoptions, after all, increased quite dramatically at just the moment when the transracial adoption of African-American children was becoming controversial. They continued to accelerate throughout the 1970s, 1980s, and 1990s, when Americans adopted more than a quarter of a million foreign children. International placements have increased much more dramatically than domestic transracial adoptions. Why? There are many reasons, but a simple one stands out. Most children have come from Asia, Eastern Europe, and Latin America. They did not represent the specific kind of difference that had bothered Americans and had tortured their history most. Children adopted from overseas were not black.